by Lorelei Sims. Softbound, 176 pages, 8-1/4" x 10". 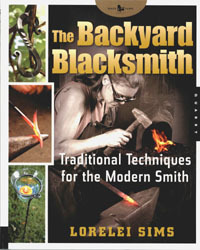 Detailed step-by-step, full-color exercises teach all the universal skills and techniques used to forge iron; like having a master blacksmith by your side. Through instructions and illustrations, readers will learn to make simple tools and useful items, such as nails, hinges, and handles, as well as an interesting mix of artful projects, such as letter openers, door knockers, and botanical ornaments. More than 20 beautiful and functional projects organized by level of difficulty allow new blacksmiths to progress at their own pace, and master the skills they learned in earlier chapters.